How to Buy Gold Nuggets - Getting Good Deals and Avoiding FAKES! Home > How to Buy Gold Nuggets - Getting Good Deals and Avoiding FAKES! I have seen a bit of a resurgence in fake gold nuggets hitting the market. To describe them more accurately, these are MAN-MADE nuggets. They are made out of real gold, but they are not GENUINE. They have been melted from scrap gold to look like real gold nuggets. I have written about this in the past, so I am going to write a bit more about what to look out for, and also link to some further reading on the subject. I highly recommend that you explore the other links in this article to get a complete picture. I have been selling natural gold online for nearly a decade now. I can assure you that I’ve seen pretty much everything. I can also say that there are plenty of honest gold sellers out there. I don’t take any issue with other dealers out there. Most of the “shady” stuff I am seeing is showing up on sites like eBay, or fake gold sellers from Africa trying to scam people on sites like Facebook and Craigslist. The first thing to watch out for is people selling “shiny rocks” that simply aren’t gold. Honestly, I don’t know if these people are being dishonest or whether they are just ignorant about what real gold actually is. It’s not that hard to figure out what genuine gold looks like. There are acid test kits that you can use to test gold, or you can do some simple test on your own to determine whether something is gold or not. If you go on eBay and search for “gold quartz specimens” or “gold in quartz” you will see tons of rocks being marketed as real gold when they absolutely are NOT. In fact there is more fake gold than real gold. They are all kinds of shiny minerals like pyrite, peacock ore, mica, etc. These contain NO GOLD and a basically worthless. Tip: If a seller is marketing a piece of ore and telling you that it contains multiple types of precious metal such as gold, silver, and platinum… they usually don’t know what they are talking about. They are either trying to dupe you, or they are clueless. Either way, don’t buy it. 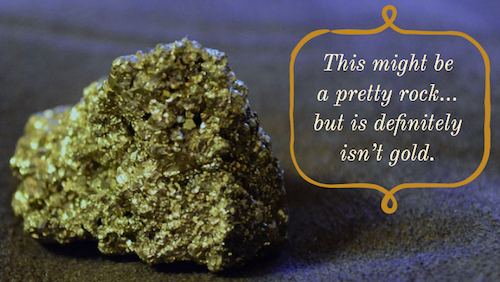 Read: Gold Rocks: Is it Real? This is another think that I am seeing more of recently… melted blobs of gold scrap that is being marketed as genuine, natural gold nuggets. What is frustrating about these is that most people without experience won’t be able to tell them apart from genuine gold nuggets, since they are made from actual gold. 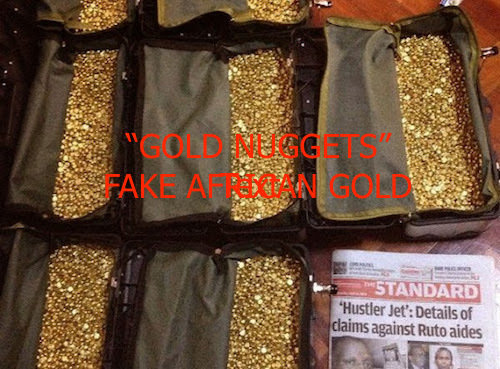 This article on How to Identify Fake Gold Nuggets has a few pictures of man-made nuggets. Unfortunately, I’ve seen some recently that are even more realistic than the ones in the picture. I can spot them easily. The texture just isn’t right… they have weird “wrinkles” in them for lack of a better word, and I can just tell that they aren’t genuine. They are likely melted piece of scrap 14k jewelry. These are frustrating though, because an acid test kit can’t differentiate them form genuine nuggets. If you don’t have experience then my best recommendation is to buy from an established dealer. That dealer could be me, but there are other good ones out there. Pretty much all established gold dealers with a website that have been around for a few years are going to be safe to deal with. Again, the places that I am seeing those sketchy fake nuggets are on sites like eBay. Here’s another thing that I find frustrating about these fake gold sellers. Many of them have stellar feedback! Despite the fact that they are selling rubbish, ranging from completely worthless rocks to golden “blobs,” it seems like they still have 99% positive feedback. I suppose the reason is because the buyer doesn’t know any better, doesn’t bother to test that “ore” that they receive, and don’t have enough experience to spot a man-made nugget in the first place. 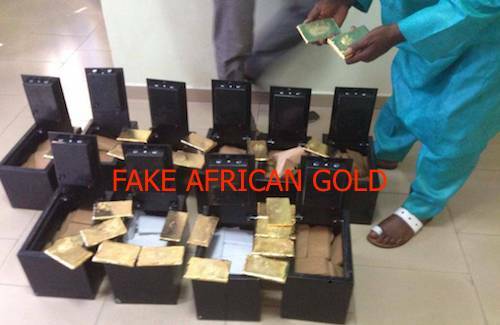 Since we are discussing things to look out for when buying gold, I should definitely warn you about so-called “discount gold” that is being sold from various countries in Africa. You will see these guys all over the place; eBay, Facebook, YouTube, etc. Some of them will even create a fake website to make themselves look like legitimate mining companies. Let me make this 100% clear… these are CONMEN, LIARS & SCAMMERS. Here’s the deal. There is no such thing as “discount gold” and just because someone is located in Ghana or Nigeria, it doesn’t mean that they would sell you gold for cheaper than the market rate of the gold. What they actually do is price the gold at well-below market rate, tricking people into thinking that they are getting a good deal. Then they will have a fake “shipping company” contact the buyer and charge various fees to cover the cost of shipping, documents, forms, etc. It's called "advanced fee fraud" and it's been around for decades. Please, please, PLEASE don’t fall for this stuff. If you want to start collecting genuine gold nuggets, make sure you are dealing with trustworthy people.